Children who have never seen wildlife struggle to draw pictures of them. This is in a rural township wedged between the affluent tourist regions of the Greater Kruger and the Blyde River Canyon. Even though they live in a world-renowned area for game viewing, they don’t comprehend concepts like loving nature, caring for wildlife and conserving its habitat. Luckily change is coming to the area where it is most required – the primary schools. 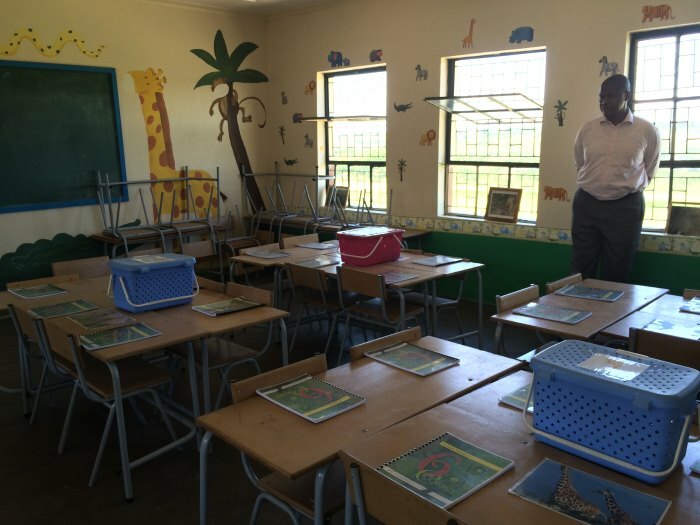 Nedbank, in conjunction with Wildlands and Children’s Eco Schools, are setting up, running and supporting environmental education in schools in Acornhoek, Mpumalanga. 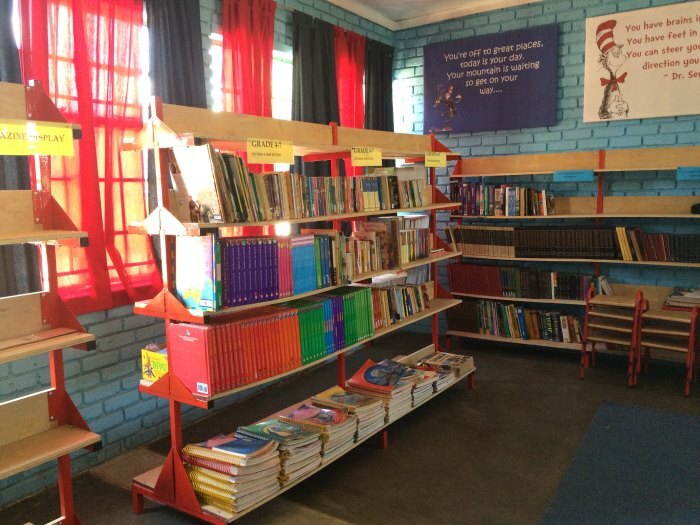 One great example of such a school is Seganyane Primary School. The eco-school within the primary school is clever to incorporate the school curriculum into the environmental education. When the children have to learn about certain plants or processes as required by the government, they are split up into groups in their classroom, where they first learn the theoretical components stipulated in the curriculum. This brings home the point that these classes are just as important for their marks as math and science. Once the theoretical side is taught, the children remain in their groups to go outside and tend to their vegetable gardens. They can now apply the knowledge practically. The vegetables that they produce are an added bonus to the school and a great way to teach children a love for all things green. The Eco Village is beautiful. Bright fencing stretches all around it and the tyres in which the vegetables are planted are painted in the same cheerful colours. It’s a place in which any child would want to spend time. The vegetable gardens are run with environmentally sound farming principles. 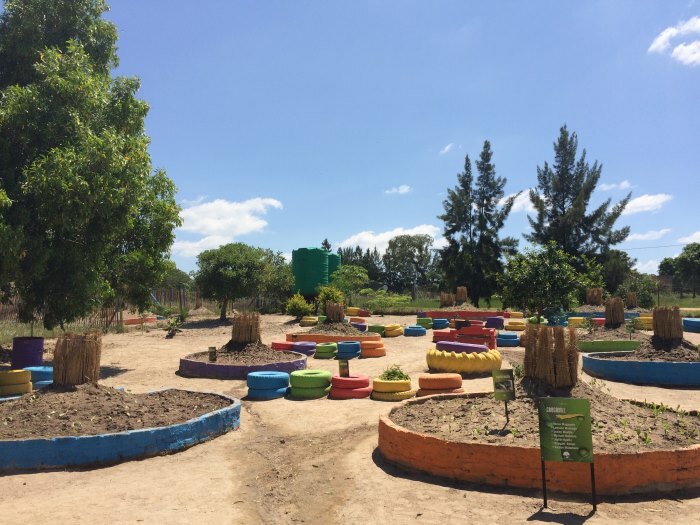 The kids collect natural items for the compost themselves and is placed into a vertical tunnel made from reeds standing in the middle of the circular garden. In this way, the compost filters into the entire garden. 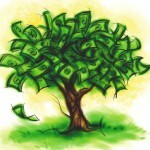 No expensive compost packaged in heavy plastic or environmentally destructive fertilizers are brought into these gardens. The children learn the sustainable way from the start. A lot of the time the cooked lunch that these children receive at school is the only meal they get in a day. Growing vegetables as part of their education means that the school feeding-scheme can be enhanced with nutritious, organic produce. The vegetables grown in the garden are often chosen according to the children’s taste or the need for either green vegetables or items like beans. The kids see for themselves the power that water has on the earth. By letting them realise how scarce water is in Africa, they are growing up loving the earth and conserving its natural resources. Another clever initiative in the school is Tippy Taps. These are recycled 2L bottles that have a hole in the cap. They are filled at the beginning of a school day and two children get to work together to wash their hands before a class. The one tips the bottle and the other rinses. In this way they wash their hands without wasting water. 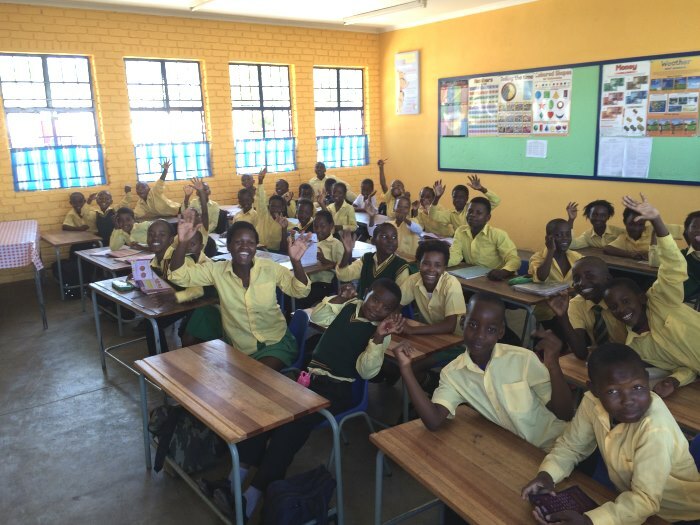 Seganyane Primary is also a participant in the Wildlands and Nedbank Trees for Life programme. With this programme, tree-preneurs (as they are called) grow mostly indigenous trees from scratch and eventually barter the trees for livelihood items that the school needs. Eco toilets, a new roof and better kitchens are only some of the improvements that have already been made at Seganyane. 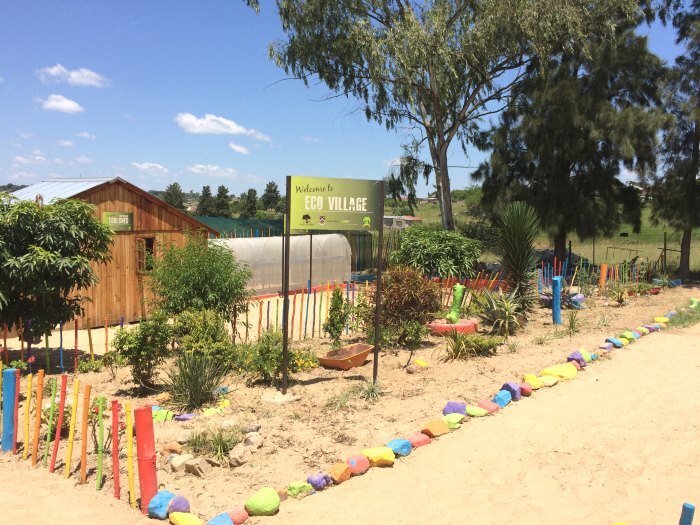 Nedbank is involved in many more eco schools around the country, where they work together to build veggie tunnels, rain harvesting tanks and solar cookers. Many of the schools in the region are already involved in the Trees for Life initiative, which inspires children to learn about different trees while giving them real life examples to touch, see and smell. 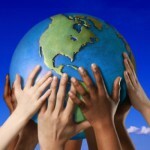 It is vital that our children’s generation is taught how to look after the earth. The root of their activism lies in their love for the planet, its plants and its animals. By letting the kids of Acornhoek visit the Kruger National Park on an exciting school trip, they get to see the rhinos that we so desperately have to protect. By setting up eco-schools and vegetable gardens they learn about the importance of a healthy environment for our plants and that it is vital to care for them if you want to grow big vegetables.